Mercedes-Benz is revising the C-Class saloon and estate with a range of comprehensive improvements including exterior styling changes and interior upgrades. There are also changes to the engines with improved efficiency and fuel economy of the upgraded models which go on sale in March 2011. According to Mercedes, there are more than 2000 new components in the revised C-Class, which is the best selling Mercedes-Benz model. From the outside the most noticeable changes are modified headlamps, rear lights and new bumpers. The grille surround is now more prominent and the central air intake opens out upwards in a V-shape, while a new aluminium bonnet helps keeps weight down. Horizontal LED daytime running lamps in the bumper have been introduced to make the C-Class distinctive from a distance and there are LED indicators in the rear light clusters. Inside there are is a restyled dashboard and the control panel of the new-generation communication and information unit has keys with a high-gloss finish. In conjunction with the new generation telematics the C-Class is now available with a high-resolution colour display in the instrument cluster. The engines have an improvement of up to 31 per cent in fuel consumption and all C-Class launch models will feature the ECO start/stop function as standard. All the engines are now classed as BlueEFFICIENCY units and in future all automatic versions will feature the further-developed 7G-TRONIC PLUS seven-speed automatic transmission. In addition, the overall ratio of all new powertrain variants has been optimised for better fuel economy. All the petrol engines now have direct injection and this includes the new V6 petrol engine with its innovative BlueDIRECT process in the C350 BlueEFFICIENCY. 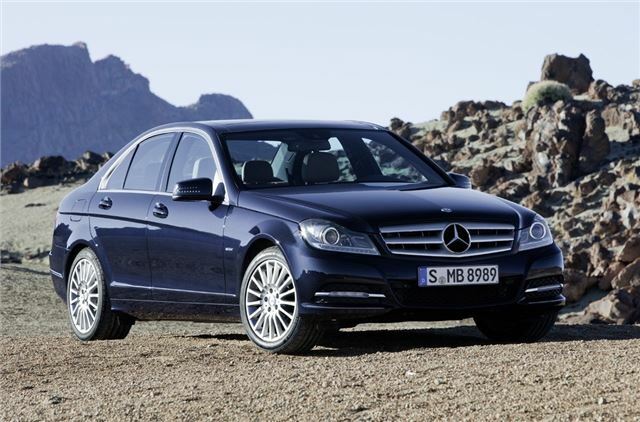 Power has increased considerably, the C350 BlueEFFICIENCY delivering 306bhp and 370Nm (previously 292bhp and 365Nm). The most economical model in the Mercedes C-Class range has also become even more frugal: the C220 CDI BlueEFFICIENCY with the manual six-speed transmission and the standard ECO start/stop function. This emits just 117g/km of CO2. In conjunction with the improved 7G-TRONIC PLUS automatic transmission and the ECO start/stop function included as standard, the C220 CDI BlueEFFICIENCY and C250 CDI BlueEFFICIENCY both average a claimed 58.8mpg with emissions of 125g/km. With a total of ten new driving assistance systems ranging from ATTENTION ASSIST drowsiness detection to DISTRONIC PLUS proximity control, the C-Class is an incredibly safe car. The assistance systems are based on the latest radar, camera and sensor technology, and cover frequent accident causes such as driving too closely, fatigue and darkness. The new C-Class also sees the debut of a new telematics generation which will also be gradually introduced in other model series. Major new features include greater operating convenience, larger displays, telephone directory transfer, display of SMS messages, wireless music reproduction via Bluetooth and a USB interface now accommodated in the centre armrest. The multimedia system COMAND Online now provides internet access for the first time (via a data enabled mobile phone). When the car is stationary, drivers are able to browse freely or surf to a Mercedes-Benz Online service whose pages load particularly rapidly and are also easy to use while on the move. The integrated services include weather information and a special destination search via Google, as well as the option of downloading a route that has been previously configured on a PC using Google Maps and sent to the car. The navigation system of COMAND Online also has added functions. As a first in the C-Class, the Becker MAP PILOT makes a low-cost navigation function, which can also be retrofitted, available for the entry-level Audio 20 CD radio. Its advantages over aftermarket solutions include integrated operation via the central controls and the Audio 20 display, a concealed location in the glove compartment and updating via an internet portal.